The Tri-City Jewish Center prides itself on providing a tuition-free Talmud Torah that prepares our children to become participating members in any congregation. Our Talmud Torah has always been a source of great pride for our congregation. The primary goal of our Talmud Torah is to give our students a sound and thorough Jewish education in the study of Hebrew, the Torah, ethics, history, traditions and contemporary world events which will influence their future lives as Jews. We are blessed to have a knowledgeable faculty composed of our own membership, who desire to share their rich backgrounds with our children. Attending and participating in services is an integral part of the education process. One of the highlights for the congregation is when a class leads a Friday night service. 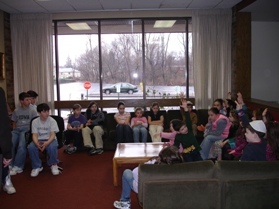 Efforts are made to collaborate with the other Jewish students in the community as parents and children participate annually in a Family Education Day. Values and community service or Tikkun Olam are emphasized throughout the year, for example at Purim when our children make baskets of food and help deliver them to shut-ins in the Jewish community. Our Talmud Torah is tuition-free where parents pay book fees and the membership supports all other expenses. Written curriculum is relevant for each grade -- preschool through Confirmation. Hebrew is emphasized during a two hour plus class during the week. Students of the Tri-City Jewish Center are prepared for Bar and Bat Mitzvahs so thoroughly that these milestones are anticipated by our families and congregants for months prior to the actual service. Many positive experiences, of educational and social value, highlight our youth-centered programs. Lasting friendships are not the least of the benefits our children derive while attending Talmud Torah.